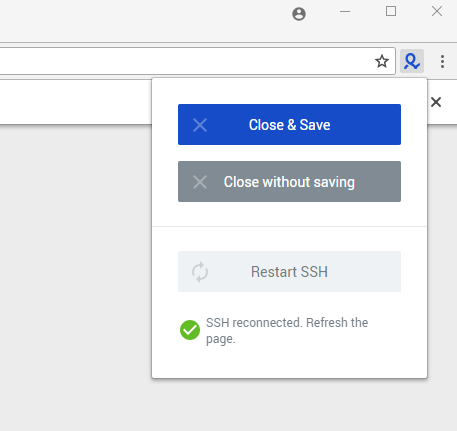 Proxy over SSH tunnel plugin allows your browser profiles to connect via an SSH server as a SOCKS proxy. Generally, SSH (stands for "secure shell") is used to securely connect to a remote terminal session. However, you can also set your SSH server to work as a SOCKS proxy. The traffic enters the SOCKS proxy running in your browser profiles and the SSH server then forwards it through the SSH connection – this is known as SSH tunnelling. The biggest advantage behind using an SSH tunnel over a conventional HTTP or SOCKS proxy is a that it can be easily set up without any additional proxy related installations on the server itself. Additionally, SSH tunnels encrypt your traffic, which allows for better data security. In order to use SSH on Windows Server operating systems, you have to enable "Developer mode" in the settings and restart PC. You can learn more about it here. Restart SSH is available in versions 3.2 or higher. Due to the nature of SSH tunnels, they can sometimes drop mid-session.